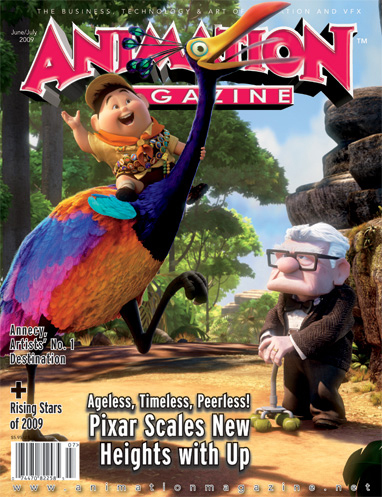 Features - "Up", the 10th feature from John Lasseter’s hit-making studio, is described as a “coming of old age” movie and travels to some uncharted territories; Marathon Media’s "Totally Spies! The Movie" offers a long-awaited glimpse at the origins of the fantastic crime-fighting girls from Beverly Hills High; PIxar's Peter Sohn sheds some light on the making of his wonderful new short, "Partly Coudy"; More than six decades after being introduced in a Belgian newspaper comic, pint-sized adventurers Suske and Wiske are getting ready for their major CG-animated movie splash. Television - John Altschuler and Dave Krinsky talk "The Goode Family’s" eco-drama with a Mike Judge spin; Alexei Alexeev’s award-winning short, "KJFG No. 5", inspires a delightful new TV series. VFX - All about the cool vfx tricks featured in three of the summer’s hot new movies. "Terminator Salvation", "Night at the Museum: Battle of the Smithsonian" and "Transformers: Revenge of the Fallen". Annecy Festival; Rising Stars of Animation: Class of 2009; Animated movie dossier.